Bicycle! Bicycle! : Two Wheels Good, Four Wheels Baaaaad. Two Wheels Good, Four Wheels Baaaaad. Note the terrible stock-photo entirely failing to illustrate the issue. Thanks for mentioning terrorism straight up, dude. I'm not sure even an obviously facetious reference to being a terrorist is entirely helpful to Australian perception of cyclists but whatever gets the click-through, AMIRITE?! Just kidding, this article does actually address the important issue of Car Vs Everyone Else culture in Australia. Namely the bizarre campaign by some newspapers and current affairs programmes to encourage enmity between people behind the wheel and people on pedals. Enmity resulting in serious injury or death. Can you imagine if you picked up a newspaper and read an article encouraging you to fight anyone you see waiting for a train? Or an article claiming that people who walk think they're better than you? Yet this is the kind of rhetoric lately published in a sustained effort to - what, exactly? Dismantle bicycle infrastructure? Spill blood on the suburban streets? 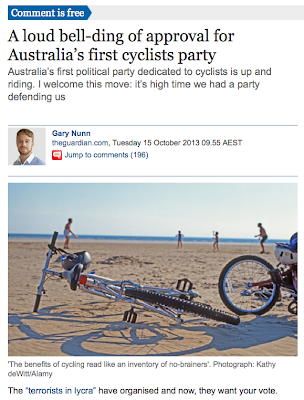 With headlines like: Police blitz on arrogant Sydney cyclists who push the law (Actual headline) or Cyclists making a fool of our bike laws (Again, actual headline) the framing of the Australian transport debate is downright irresponsible. These headlines are poking motorists in the chest and saying, "A cyclist is laughing at you RIGHT NOW - what are you gonna do about it?" 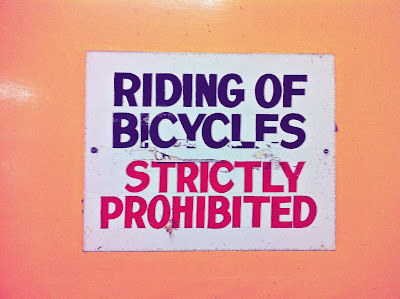 as though all cyclists are deliberately provocative. 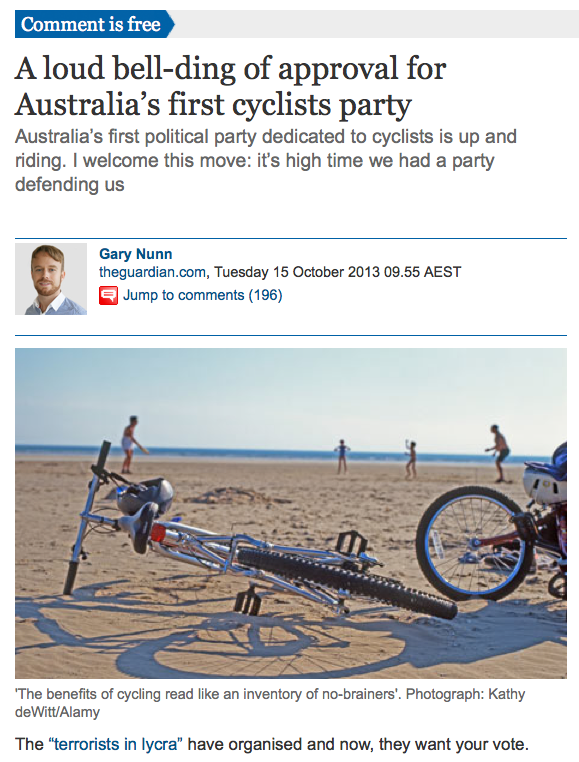 As though Australian cyclists are not also (mostly) car drivers. 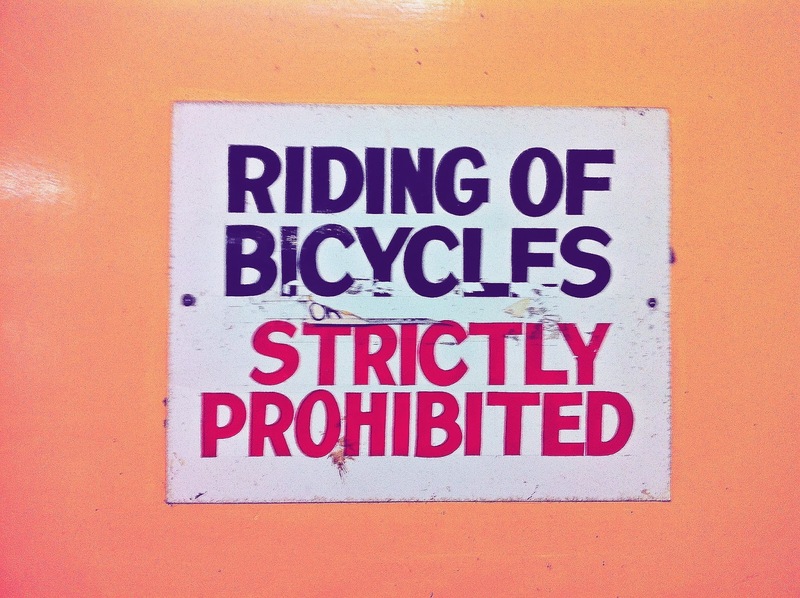 As though getting on a bike is an act of deliberate douche-baggery rather than a mode of transport. When was the last time you saw the headline Police blitz on arrogant motorists who flout speed limits? Bad motorists and bad cyclists happen every day. I'm betting there's even a large crossover in that particular Venn diagram (Show me a dickhead on 2 wheels and I'll show you dickhead on 4). But even if a motorist breaks enough laws to warrant a headline, I'm also betting there was a lack of character judgement in that headline. And if the issue is a problem group of recurrent law breakers within the group of people designated as 'motorists', I'm betting the more likely headline is: Police accused of revenue raising through speeding fine blitz. Just as irrelevant as the one above but at least it's not a stock-photo. Look. People who deliberately 'push' road rules are all arrogant douche-bags in that moment, regardless of whether they're on rollerblades, bicycles or driving cars. Even if they are upstanding citizens in every other situation. That's because every single one of us believes that MY journey is more important, MY time is most precious and if I break the law it's because I HAD A GOOD REASON. See also: It was safer/I was tricked/I didn't have a choice. We're all to blame, not just George Orwell. The Australian specific problem is that we are so collectively in love with cars as an extension of ourselves (and ourselves are never wrong, remember) that we just don't view laws broken while driving as 'really' breaking the law. Ask your friends how many speeding fines they've had in their driving careers. Go ahead. Omar Khalifa, who is launching the new political party, says “a motorist’s best friend is often a cyclist.” They ease congestion, lessen fuel demand and free up parking spaces. It’s irresponsible to promote bad feeling between motorists and cyclists. We need to co-exist harmoniously – no good can come of any campaign that seeks to do otherwise. Now that's the kind of sentiment I'd vote for.